On 2 June 1924, during a blistering early summer in Chicago, a ravaged courtroom bruiser stepped into the future. Clarence Darrow, with his seamed face and stooped shoulders making him look every one of his sixty-seven years, was America's great defender of the lost and the damned. Earlier that day, Darrow had agreed to represent Nathan Leopold and Richard Loeb, two teenage lovers and the sons of Chicago millionaires, after they confessed to the world's first 'thrill-killing' of a fourteen-year-old boy with whom Loeb had sometimes played tennis. 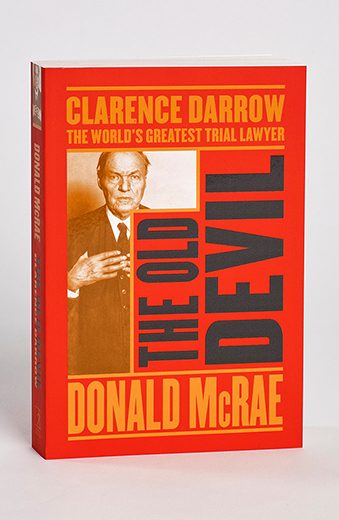 In fact, Darrow was about to plunge into an extraordinary trilogy of cases that would seal his legacy as the most influential trial lawyer in history. Darrow's last trio of major cases pushed back legal boundaries as he tussled with issues that continue to be strikingly pertinent. In two dizzying years, he pioneered campaigns against capital punishment, religious fundamentalism and racism, while setting precedents in using psychiatric profiles, expert witnesses and a new form of courtroom showmanship. The trial of Leopold and Loeb centred on his most passionate cause - overcoming the death penalty - yet the Chicago Sun-Times insisted he had sold out for "a cool million bucks." The newspaper branded him a hypocrite who, having always fought for the poor and unfortunate, had rushed to defend the impossibly rich for a reprehensible murder. Darrow's modest fee was actually decided by the Bar Association. As part of a surreal sexual pact, Leopold and Loeb had randomly chosen the young Bobby Franks as their victim. They lured him into a rental car and, "for the thrill of it", killed him on a suburban side-street. After their arrest, the nineteen-year-old Leopold stunned reporters by suggesting that the killing was an intellectual experiment: "It is just as easy to justify such a death as it is to justify an entomologist killing a beetle with a pin." Leopold claimed he and Loeb were intellectual supermen galvanised by Friedrich Nietzsche's Beyond Good and Evil. Loeb, eighteen and better looking but not as well read, smirked that, "This thing will be the making of me." The US was fixated by the case - and the public thirst for execution was so intense that individual citizens stated their credentials as hangmen. A Michigan pensioner offered $100 for the privilege of hanging Leopold and Loeb. "I am sixty-six-years-old, but I am game. I have no use for such fiends." Yet Darrow, in a closing address spanning an extraordinary three days, produced one of history's most compelling courtroom speeches against capital punishment. On the third day, despite the blue brilliance of the sky outside, he thundered: "Through history you can trace the burnings, the boiling, the drawing and quartering, the hanging of people in England at the crossroads ... I am begging this court not to turn backward to the barbarous past. I am pleading for the future ... when hatred and cruelty will not control our hearts, when we can learn that all life is worth saving; that mercy is the highest attribute of man." Darrow was hailed by Variety as "America's greatest one-man stage draw" after his next case, the following summer, saw him confront religious fundamentalism in a trial that became just as famous as Leopold and Loeb. Described as "a duel to the death" between Darrow and the prosecuting attorney [and former Democratic Party leader] William Jennings Bryan, the 'Monkey' trial began as a stunt. The American Civil Liberties Union hoped to challenge a new law that prohibited the teaching of evolutionary theory in Tennessee. A local teacher, twenty-four-year-old John Scopes, agreed to be arrested. The ACLU was less impressed when national hysteria, sparked by the enmity between Bryan and Darrow, swamped the trial. Bryan warned, "If evolution wins, Christianity goes." Darrow responded forcefully: "John Scopes isn't on trial, civilisation is on trial. The prosecution is opening the doors for a reign of bigotry equal to anything in the middle ages." A furious showdown could only be resolved by a crushing cross-examination from Darrow, who surprised everyone by calling Bryan to the witness stand. He then dismantled the pompous politician, ridiculing his denunciation of scientific fact in favour of biblical allegory with such force that, at the end of that week, Bryan suffered a massive stroke and died. "There's a rumour about town," Scopes wrote, "that 'the old devil Darrow' killed Bryan with his inquisition." Three months later, in October 1925, Darrow again put himself at the heart of controversy by attempting to prevent the apparently inevitable execution of an eminent black doctor, Ossian Sweet, and ten other 'negroes' accused of murder. Their crime had been to defend themselves against a lynch mob that surrounded the Sweet family's house as soon as they had moved into a white neighbourhood in Detroit. Sweet asked his two brothers and some friends for help and, on the second night, when the mob closed in and a rock smashed a window, Sweet's youngest brother, twenty-one-year-old Henry, fired into the dark. He hit two men, killing one and injuring the other. All eleven in the house were charged with murder. Darrow exposed the violent racism of the Sweets' neighbours and a mistrial had to be declared in November 1925, when the all-white jury could not reach a verdict. In the second trial, when Henry Sweet was placed alone in the dock, Darrow asked the white jurors questions that made them gasp. "If you had a choice," he murmured, "would you lose your eyesight or become coloured? Would you have your leg cut off, or have a black skin?" Darrow was magisterial in exposing the racism that scarred America, prompting Ossian Sweet to say, "I faced the same mob that had hounded my people through its entire history. I was filled with a peculiar fear, the fear of one who knows the history of my race."